Did you enjoy designing your nursery decor? It was one of the things I loved most about being pregnant. I thoroughly enjoyed browsing and planning what to buy for the little baby wriggling inside me. I went for neutral nursery decor, with off white walls, and white furniture, so that it would be versatile. Ryan didn’t want to know if we were having a boy or a girl. Unfortunately the sonographer gave it away, and got all flustered. We were pretty sure we were having a girl, but not enough to buy anything pink! When Ava arrived (once I’d got over the shock of being a new mum) I went to Mamas & Papas to pick up the gorgeous wall stickers and matching Dream Pod I’d had my eye on. Her nursery was ready when she moved from her Moses basket in our room We kept the decor the same when Thea came along as we still loved it. I have kept the Dream Pod to pass down to the girls if they every have a baby, as it’s still in perfect condition. Seven years later, I favour a more neutral nursery decor scheme with lots of grey, to offset the touches of pink. Introducing Perfect Neutral Nursery Decor from Niki Jones at Mamas & Papas I was in Mamas & Papas the other week, looking for a gift, and I felt a little emotional. The girls are long past the baby stage at five and seven, but I have so many happy memories of shopping for nursery decor and clothes when I was pregnant, and when they were little. Mamas & Papa’s latest limited edition collaboration, with Glasgow-based designer Niki Jones is simply stunning. It’s full of gorgeous on-trend geometrics in a neutral colour palette that works beautifully for boys and girls. I’d have bought the whole lot when the girls were little; the attention to detail and handcrafted feel give a real heirloom quality. This neutral nursery decor is not only gorgeous for babies, but has lots of pieces that will last for years to come, like the star lampshade and cushions. Mamas & Papas sent me some key items from the Niki Jones collection to to update Thea’s bedroom. This two tone grey Niki Jones Lotus Rug is 100% wool and so thick and so plush and comfy to sit on. 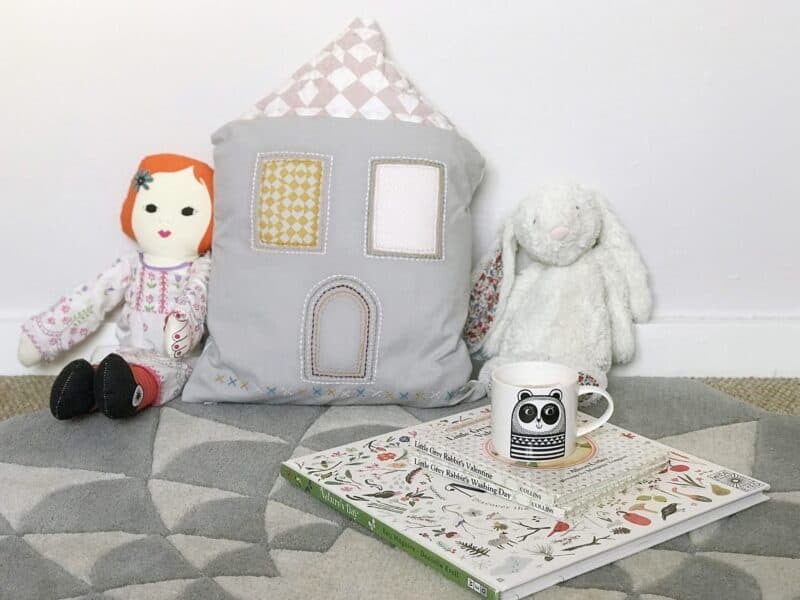 It coordinates perfectly with the adorable Niki Jones Cotton Geometric Print House Cushion and they look perfect in Thea’s big girl room. Thea is very pleased with them too and loves sitting on the rug looking at her books. I love the embroidery detail and the blush pink and mustard highlights on the house cushion, and Thea says it’s very cuddly. I actually fell asleep on the rug last night when I was waiting for Thea to brush her teeth: it’s very thick and comfy. The Story Behind the Niki Jones Collection Niki is a mum herself, so her experience has shaped the collection, with the notion of nostalgia running as a narrative throughout the range. She explores how objects grow up with the parent and child, in turn, capturing memories. The shades of grey create the perfect neutral nursery decor, and won’t date at all. The geometric shapes are beautifully simple and unfussy, so would be perfectly at home in a modern or traditional nursery. In fact, the whole collection is making me rather broody! I love how Mamas and Papas are a one stop shop for nursery decor. Their collections let you create a simple, chic look that’s guaranteed to look good together. Although Pinning ideas and sourcing the perfect things for my home is my obsession, it’s lovely to be able to get it all in one go, with no stress! Thea’s Big Girl Bedroom As you can see, the house cushion and rug go perfectly in Thea’s big girl room, complementing the pale grey walls and pops of pink and turquoise. I know this rug and cushion will be a key feature of Thea’s room for years to come. I think it’s worth investing in decor items that will still be stylish and go with their rooms for years to come, rather than redoing it every year. Why not Pin my neutral nursery decor ideas for later?